Each week for a year they've gathered to protest against corruption in the Israeli government. 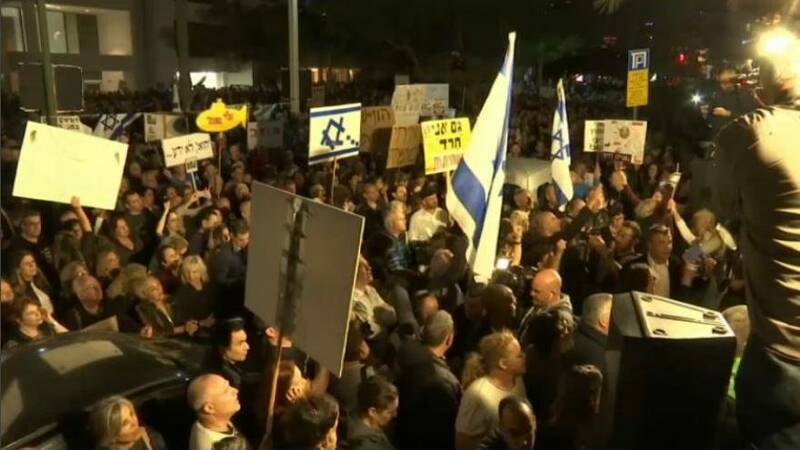 But with an estimated 20,000 people attending, Tel Aviv has seen the biggest "March of Shame" yet. There were rallies in Jerusalem and Haifa too. "The public has long since grown tired of the organised media campaign to topple PM Netanyahu and replace the government." Grassroots protesters are angry about a draft "recommendations law" which would bar the police from publishing the findings of investigations into unscrupulous politicians. They believe the bill is desiged to shield Prime Minister Benjamin Netanyahu, who is being investigated on allegations of bribery, fraud, and breach of trust. He has been questioned by the police six times about allegedly accepting gifts from businessmen and a deal with a newspaper owner to curb a rival paper in exchange for better coverage. Campaigners want to see him indicted and removed from office. "On Monday, in the Knesset - in the parliament - there is this voting [sic] about the law that will actually castrate the police force and not enable them to do their job, and allow the crooked politicians actually to hide all the things they have done without any public transparency." The Prime Minister's Likud party want to push the recommendations bill through parliament as quickly as possible so that it will apply to the leader. Benjamin Netanyahu, currently in his fourth term as Prime Minister, has denied wrongdoing and says the accusations amount to a witch hunt led by a hostile media.